In addition to records, we have a few artefacts in our collection. Today I’d like to introduce you to one of our artefacts from the Children’s Union. As a fundraising body that was supported almost solely by children, the Children’s Union had a number of ways to promote the work of The Children’s Society and encourage children to make donations. One of these ways was to give out medals to Children’s Union members in recognition of their support. Often these medals had to be earned by the members completing certain tasks. There were a few different types of medals that were given out by the Children’s Union over the years. The medal above was designed in 1910 by Sir Nevile Rodwell Wilkinson, husband of the president of the Children’s Union, Lady Beatrix Wilkinson. This medal was given out for ‘special service’, and members could earn one of these by attracting six or more new Children’s Union members or helping to raise £20 for the Children’s Union. 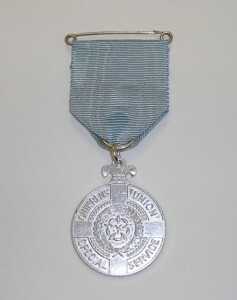 The special service medals were used during a large part of the life of the Children’s Union. We have a number of examples in our collection, including some that appear to have been made as late as the 1970s, shortly before the Children’s Union was disbanded. It’s easy to imagine that these medals would have been a large incentive for the members of the Children’s Union, and that the children who received them would have been very proud to get recognition for their hard work. Don’t be alarmed; this isn’t a post about obscure footwear fashions! Instead, I’d like to talk about one of the skills taught to children at St Chad’s Home for Girls in Far Headingley, Leeds: the use of knitting machines to make hosiery. St Chad’s was a home that took in both disabled and non-disabled children. It opened in 1889 and ran for many years until it was commandeered as an air raid precaution station in 1939. 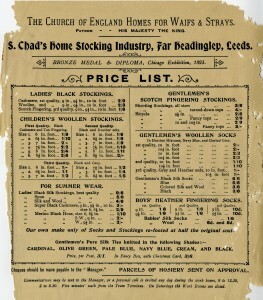 When it opened, the aim of St Chad’s, like many of The Society’s homes, was to teach children a trade so that they would be able to earn their own living and become self-sufficient once they were old enough. 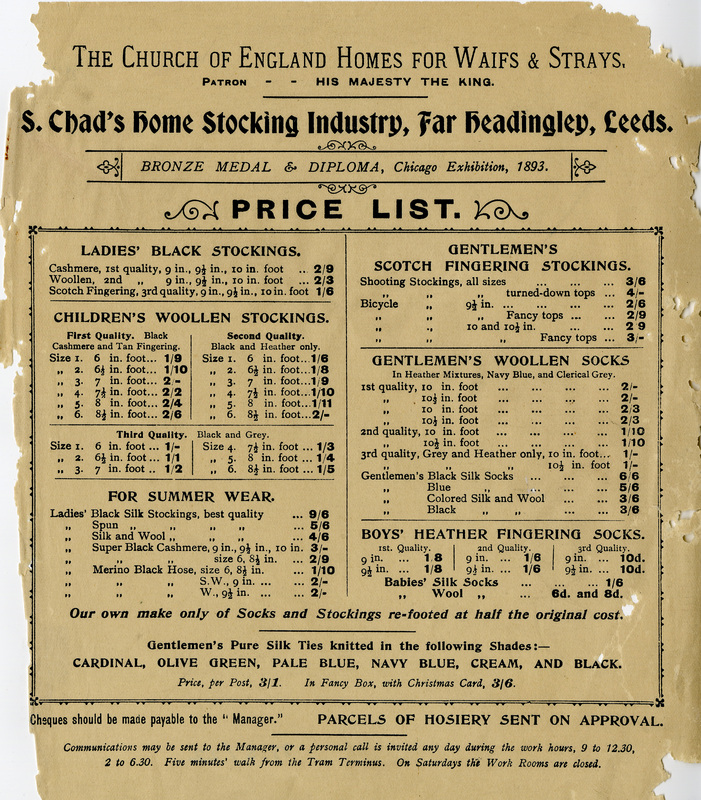 The majority of homes at the time trained children to work in domestic service, but St Chad’s was different; instead of domestic service, it specialised in teaching children to use knitting machines. The knitting machines were used to make hosiery, and the above flyer lists some of these items that were made by the children at the home. This machine knitting was run as a small business, with the socks, stockings and ties made by the children sold around the country to help pay for the home’s upkeep. Machine knitting was often seen as a suitable trade to teach to girls who were considered unable to work in domestic service, such as those with mobility difficulties, learning disabilities or behavioural problems. The focus on machine knitting at St Chad’s Home meant that many disabled girls were sent there from across the country with the hope that they would be able to learn a trade and find a place to work once they left The Society’s care. Further information about St Chad’s Home can be found in the homes section of Hidden Lives Revealed.